Going on the Ran Dan tonight? Before taking a skinful why not get clued up on tatties over at the Community Centre this evening? I want to know how come all my apples had apple scab this year, when there was no sign last year. Was it the wet July and is it there to stay for.next year? As this ruined what would have been a good crop. Well you can ask that question if you have a fiver to spare. Alternatively ask Mr Google he's a bit cheaper, but yes it was a bad year but even when the fruit looks bad it can still be quiet edible if peeled. Thanks for the tip. I'll probably not go now (was going to primarily for the gargeners question time), just Google my questions and maybe buy a pot of tea in a cafe in Nairn elsewhere for less than a fiver. Any other Community Council money saving tips? I went to this last night and it was very enjoyable. New respect for the tattie! 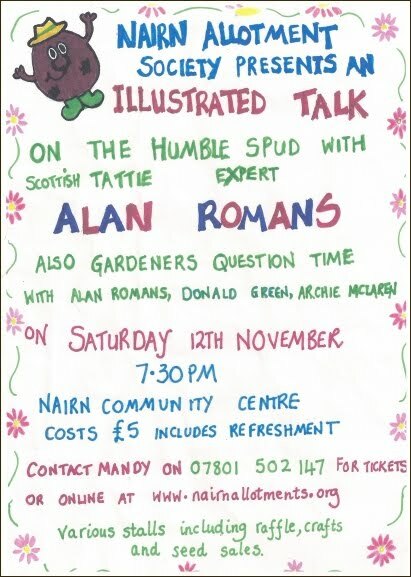 Well done the Allotment folk for organising it and well done Mr Romans for his very interesting talk.